Being one of only 306, right-hand drive, UK 968 Sports produced during 1994 and 1995 forming part of the run of the Club Sport model produced by Porsche and registered in March 1994 the car could well have been driven home via the eagerly awaited channel tunnel which opened in Spring of that year. Badged as '968 Sports' in the UK, all are genuine ' P35 ClubSports' with the Luxury Package option which included electric windows, rear seats, sunroof and other refinements. In addition, the car comes with colour-coded 17 Inch Cup II wheels, reduced Radio preparation, mechanically adjustable seats and to compliment the discreet tone of the bodycolour, deletion of the model designation. 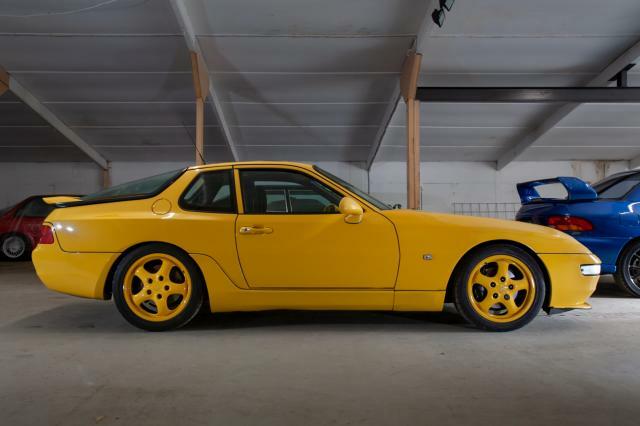 Coming with a full-service history comprising twenty-two service stamps and a binder bursting with reassuring notable invoices along with the leather Porsche document folder, owner’s manual, original tool kit, compressor and spare key this Sport is unable to hide its cherished low number ownership history. Reassuringly, the all import timing belt, tensioners and water pump were changed precisely 3 years/7000 miles ago. The near perfect yet restrained ‘X4 Speed Yellow’ paint is complimented by black fabric Recaro cord seats in impeccable condition offering the perfect environment to enjoy the six-speed gearbox, the rev hungry four pot motor and the exceptional levels of grip offered by the composed chassis. Walter Rohrl declared the CS ‘the best handling car that Porsche made’ and he knows his onions!